At Symmetry Counseling, we are proud of our staff of highly trained and experienced licensed mental health professionals. 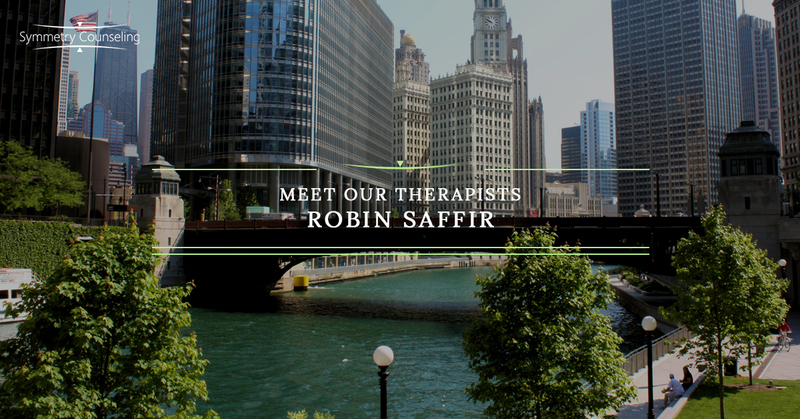 In the above video, meet Robin Saffir, a National Certified Counselor here at Symmetry Counseling. I’ve wanted to be a therapist for as long as I can remember. When I was about seven years old, a family friend who was a therapist told me I should consider being a therapist when I grow up. He actually offered me a job at his practice if I ever did choose that as my career path. Fast forward a few decades later, here I am, but I chose to move to Chicago instead of practicing out of Connecticut. I work with clients with a range of treatment goals, such as depression, anxiety, stress management, relationship issues, life stage adjustments, work/life balance, but I really focus on and specialize in incorporating mind/body practices and exploring the mind/body relationship in my therapy sessions and with my clients. I do treat eating disorders, disordered eating, those struggling with their relationship with food and body image, but moreover with my clients in general, as a therapist, I aim to help my clients connect more deeply with their mind and body, their heart and their head. So I use the relationship between the mind and body as a tool to stimulate grow and healing. I am also trained in something called Emotional Freedom Technique. This is the systematic tapping protocol which incorporates both the mind and body. It utilizes the mind/body relationship to stimulate emotion regulation. I’m an integrative practitioner, meaning that I like to blend many different theoretical foundations. I like to tell my clients that I take an 80/20 stance in our sessions, meaning that 80 percent of the time, we are focusing on uncovering and exploring emotion and then 20 percent of the time, we will be focused on implementing problem solving and coping techniques and coming up with steps to implement life changes. I really enjoy being a therapist because I love working with people and talking to people. I feel honored to be somebody my clients confide in and trust. I also love that being a therapist means that I am constantly learning, not only in an academic sense but also just from each of my clients every day. If I were an animal, I would want to be a wolf. They are intelligent, intuitive, loyal, creative, and they are also pack animals which speaks to me because I highly value my deep relationships and connections with others. For self-care, I love to do face masks. I was kind of pulled into it because I was given a free sample and I’m hooked. So be careful of those free samples, you never know what will happen. I love to paint and I have only been living in Chicago for a few years, so I’m still exploring the city. I love walking along the lake; it’s so beautiful here. I’m also, like I said, new to Chicago, new-ish to Chicago, so because I am from New England I will always be a Patriots fan at heart but now that I am permanently located in Chicago, I’m spending a little bit of time getting to know and getting invested in Chicago sports specifically. The Bears right now, so we’ll see how that goes. I am neither an early bird or a night owl. Maybe a little bit of neither, maybe a little bit of both. In my perfect world, I would wake up early, go to bed late, with a nice chunk of time in the middle of the day to nap and relax, but unfortunately, that’s not exactly how it works. My favorite quote is actually my high school yearbook quote, which is, “Change is inevitable, growth is optional.” So if it wasn’t pretty evident that I wanted to be a therapist from an early age, I guess that quote pretty much does it.